In their Centenary season Wales opened their Five Nations campaign with a 21-19 victory against England in Cardiff. Centre Steve Fenwick won the match with an injury-time penalty after Brynmor Williams had tricked Clive Woodward into straying off-side at a scrum near the English line - " the most perfect hoax since painter Tom Keating fooled the entire art world" according to the Daily Express. "I feel terrible, not just for me but for tho rest of the team," Woodward admitted. "It was a stupid thing to do, especially as before the scrum I was the guy going round telling the team not to give away penalties." But that was the highlight of what the paper summed up as: "The 80-minute kicking duel of Dusty Hare v Steve Fenwick will surely go down as one of the most exciting bad matches ever played." 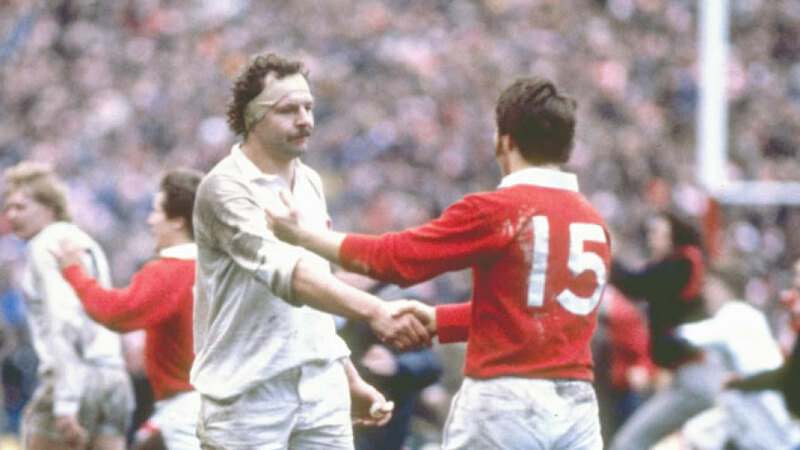 Welsh fullback JPR Williams played his 11th and final Test against England, finishing with a 100% record. JPR Williams powered through for two tries in Wales's 21-9 win against England at Twickenham. Williams also needed seven stitches in a face wound sustained when he was hit by Andy Ripley's boot while making a tackle, but the doctor had to remove six existing stitches - inserted a week earlier - before putting in the new ones. "I feel like a patchwork quilt," Williams grinned. But the Welsh were oddly subdued afterwards, admitting they were unhappy with the way they played. "It's comforting to know we can fall below our high standards and still win," said coach John Dawes. "But there is more to winning than scoring points. The quality of our game matters to us." Jerry Shea became the first international player to go through the card of scoring actions. His try, conversion, penalty and two drop goals help Wales to a 19-5 win over England. Shea also boxed successfully as a professional. A train on the Southend to London line was renamed after England World Cup-winner Jason Leonard who was born in Barking. "I thought parading around London on an open- topped bus was the peak of my career after the World Cup but having a train named after me, is a real tribute. I am very, very flattered." New cap Dewi Bebb scored the only try of the match as Wales beat England 5-0 in filthy weather conditions at Cardiff. Despite the conditions, the result was rarely in doubt. "We didn't think we would have it so easy," said Wales skipper Clem Thomas. "With all that mud and rain, we knew what the drill had to be - kick and rush with the forwards driving through at every opportunity. England never seemed to see the light. They tried to play dry-ball stuff, so we didn't really have a lot to worry about." Double celebration for Cardiff Blues. First their boss Leighton Samuel announced a planned merger with the Warriors had been shelved and then later in the day they ended a ten-match losing streak in Europe with a 21-20 win at home to Biarritz. It should have been 11 on the trot but Dimitri Yachvili skewed a relatively simple conversion attempt. The Cardiff club supplied a record ten members of the Welsh side that drew 3-3 with England at Twickenham.